Dr. Willard’s Water combined with Aloe Vera and Vitamin E, made into a convenient-to-use gel form that won’t run-off or evaporate like the liquid does when applied topically. This is NCI's multi-topical-use Willard's Water product and is only available from NCI. 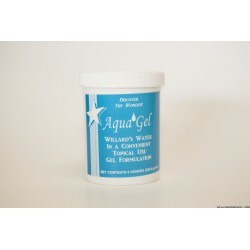 (Item AG-8): Dr. Willard’s Water combined with Aloe Vera and Vitamin E, made into a convenient-to-use gel form that won’t run-off or evaporate like the liquid does when applied topically. This is NCI's multi-topical-use Willard's Water product and is only available from NCI.